The pathogenic role of invasive fungal infections (IFIs) has increased during the past two decades in Latin America and worldwide, and the number of patients at risk has risen dramatically. Working habits and leisure activities have also been a focus of attention by public health officials, as endemic mycoses have provoked a number of outbreaks. An extensive search of medical literature from Latin America suggests that the incidence of IFIs from both endemic and opportunistic fungi has increased. The increase in endemic mycoses is probably related to population changes (migration, tourism, and increased population growth), whereas the increase in opportunistic mycoses may be associated with the greater number of people at risk. In both cases, the early and appropriate use of diagnostic procedures has improved diagnosis and outcome. The pathogenic role of invasive fungal infections (IFIs) has increased during the past two decades. As diagnostic tools have been improved and the number of patients with an immunosuppressive state (HIV, hematopoietic stem cell transplantation [HSCT], chemotherapy for cancer patients, autoimmune diseases) has risen dramatically, clinicians and scientists have begun to look more deeply into the mechanisms of disease and their relationship with susceptible populations. Working habits (agriculture, livestock activities) and leisure activities have also been the focus of attention by public health officials, as a number of outbreaks of endemic mycoses have been considered to be a result of exposure to higher inoculum of microorganisms in their natural habitat [1, 2•, 3•, 4, 5, 6, 7, 8]. The number of scientific publications has also increased, particularly in high-resource countries, though this is not the case in Latin America, where only a few groups of scientists (in Brazil, Colombia, and Argentina) have reported their experiences, mainly discussing epidemiologic surveillance (incidence, prevalence, morbidity and mortality rates, and risk factors). A number of relevant reviews recently have become available. This article is divided into two sections: endemic mycoses and opportunistic IFIs, with special emphasis on histoplasmosis, coccidioidomycosis, paracoccidioidomycosis, cryptococcosis, invasive candidiasis, and aspergillosis and infection by other filamentous fungi. This is the most prevalent disseminated mycosis in Central America, in the so-called histo belt of the central United States (particularly in the Ohio and Mississippi river valleys), and in the southeastern regions of Mexico. Histoplasma capsulatum lives in soil, especially under alkaline conditions (pH between 5 and 10) and with ambient temperatures between 20°C and 30°C. Dormant and active infections have been observed in miners, geologists, guano workers, farmers, and archeologists. Several outbreaks have been observed after accidental exposure to large quantities of bird and bat droppings in in endemic areas. Several cases have been reported in European and US citizens as well as local tourists who visited caves in Belize, Costa Rica, Dominican Republic, Ecuador, Guatemala, Mexico, and Peru (Fig. 1) [4, 9, 10]. The reported annual incidence in México was 0.29/100,000 inhabitants between 1953 and 1997, whereas in the United States, the incidence was much higher, at 3.4/100,000 inhabitants. Prevalence studies using skin testing have shown reactivity between 5% and 50% in different regions, mainly reflecting dormant infection. This type of infection has also been found in other regions, such as in northeastern Argentina (Tucuman), with a prevalence of 4.5% to 67%; la Serra do Mar in Brazil; the Pampa Humeda; and the Parana and Uruguay river valleys, Venezuela, Ecuador, and Colombia [11, 12, 13, 14, 15•, 16]. Two biotypes infect humans: H. capsulatum var capsulatum and H. capsulatum var duboissii; however, eight clades have been defined by molecular tools: 1 and 2 in North America, A and B in Latin America (clade A more common in Brazil and clade B in Colombia and Argentina), and the Australian, Indonesia/Netherland, Euroasiatic, and African clades. Several polymorphisms have been detected in the yps3 gene, which encodes a surface protein; its expression has been related to virulence. These polymorphic fragments also show a geographical distribution: polymorphisms 3, 5, and 6 are more commonly found in Latin America and 2 is found in North America [10, 17, 18, 19•]. Histoplasmosis is considered an AIDS-defining illness. In Latin America, the prevalence varies between 2.1% and 20%; it is an AIDS-defining infection in 30–75%, usually seen in patients with fewer than 100 CD4+ cells. Pulmonary disease is the most common presentation, followed by cutaneous involvement; disseminated disease is found in up to 50% of the cases. In Latin America, histoplasmosis is concomitantly diagnosed with tuberculosis in 10% to 20% of cases with disseminated disease, whereas this co-infection is observed in only 4% of patients in Europe and the United States [14, 15•, 20, 21, 22]. Several genetic differences between North American and South American strains have been identified using molecular typing methods that may explain clinical and experimental differences among HIV co-infected patients. South American strains usually behave more aggressively [23, 24]: in Mexico, for example, strains EH-53 and EH-46 have been isolated from non-HIV patients and strains EH316-19, EH323, and EH325 from HIV patients. Dermatotropism is also more common in South American isolates, with cutaneous involvement seen in 40% to 80% of patients (up to 90% in reports from Argentina and Panama), compared with fewer than 20% of US patients [25••]. Polymorphisms of the internal transcribed spacer (ITS) region (based on 7 positions) have been associated with two cutaneous variants, Hc1 and Hc2; these variants have been observed in Brazil, Argentina, Colombia, and Asia and were absent on North American isolates [10, 17, 19•, 26]. According to the 2007 guidelines of the Infectious Diseases Society of America (IDSA), the first-choice treatment for discrete to moderate histoplasmosis should be itraconazole, and for severe forms, amphotericin with prednisone followed by itraconazole . This endemic IFI is caused by species of Coccidioides. It is highly prevalent in dry regions (<600 mm of annual rainfall) with high temperatures. The natural habitat of the species is 5 cm to 30 cm below the surface of alkaline soils. Weather conditions are usually extreme, ranging between 0°C and 45°C. The two distinct species are endemic in different regions: C. immitis in the San Joaquin Valley in California and C. posadasii in Arizona, Texas, Mexico, Central America, and South America. DNA sequencing of C. posadasii has enabled investigators to approximate the geographic origin of the infection. Restriction fragment length polymorphisms also are useful in identifying the two species. Zimmermann groups I and II correspond to C. immitis and C. posadasii, by means of five differences in nuclear genes (CHS1, pyrG, tcrP, serine-proteinase antigen, CTS2) and nine single nucleotide polymorphisms (SNPs) [3•, 12, 28••]. There are three distinct endemic areas in Mexico: the north (near the US border), the Pacific coast, and the central valley. Skin testing using coccidioidin has revealed a prevalence of 5% to 30%. In Central America, two endemic areas have been identified, the Motagua River valley in Guatemala and the Comaya valley in Honduras, with positive skin testing up to 42%. In South America, four countries have areas with high prevalence: in Argentina, the Sierras Pampeanas; in Colombia, the Magdalena, Guajira, and Cesar provinces; in Paraguay, the area of the Great Chaco; and in Venezuela, the Departments of Falcon, Lara, and Zulia (Fig. 1). Brazil is not an endemic region, but several outbreaks in the Piaui and Ceará districts have been reported in association with armadillo hunting [3•, 12, 29, 30•, 31]. Increased incidence has recently been reported in Argentina and the United States, mainly owing to migration and new settlements in high-risk areas. In Catamarca, Argentina, the incidence rates grew from 0.6 cases per 100,000 inhabitants before 2006 to 2.1 in 2009. Most cases in the United States and Mexico occur in individuals younger than 5 or older than 55 years. In contrast, the higher incidence rates observed in South America involve those 25 to 35 years of age. Pulmonary outbreaks usually have been associated with earthquakes, military encampments, construction sites, and archaeologic excavations [31, 32, 33, 34, 35]. Up to 40% of those infected develop the disease, but less than 1% of these patients have progressive pulmonary disease with dissemination, which mostly affects patients with associated risk factors such as HIV, diabetes mellitus, chemotherapy, transplantation, or third-trimester pregnancy. This last situation favors disseminated disease 40 to 100 times more often than in the general population, and mortality rates increase up to 90%. Individuals of African American or Asian descent have the greatest incidence and risk of dissemination, whereas Hispanics have the lowest incidence. Another independent risk factor is the presence of an allele (HLA–II DRB1*1301) on chromosome 6p21.3 [3•, 11, 35, 36]. Clinical manifestations are usually pulmonary, with reticular and/or miliary disease that can progress to frank cavitations. In Latin American patients, the most common manifestations of disseminated disease are cutaneous, osteoarticular, or meningeal. Coinfection with tuberculosis has been reported occasionally, especially in white men and Hispanic migrants [29, 37, 38]. Treatment with amphotericin B, itraconazole, or fluconazole is recommended for severe pulmonary or disseminated disease. Only amphotericin B is recommended for pregnant women [39, 40]. This is a South American endemic IFI caused by dimorphic species of the Paracoccidioides brasiliensis complex. This complex is comprises three species (S1, PS2, and PS3). In endemic regions, the prevalence of the infection may be as high as 75%, affecting both men and women; 1–2% will present active disease. About 1.4% of cases are coinfected with HIV. Of all active cases, 80% are reported in Brazil, especially in the south and southeast regions, where the annual incidence is 10 to 30 cases per 1,000,000 inhabitants. In other regions, such as north Argentina, Venezuela, and Colombia, the incidence is much lower, about 2.4 cases per 1,000,000 inhabitants. Sporadic cases have been reported in México (Veracruz) and Central America, with several imported cases found in Spain and Japan. P. brasiliensis remains confined to particular geographic areas (Fig. 1), predominantly in tropical and subtropical regions with moderate temperatures (17º–24°C) and heavy rain (>1,400 mm of annual rainfall) [3•, 11, 28••, 41, 42••, 43]. Molecular epidemiology performed by RFLP/RAPD analyses have identified subspecies that affect particular regions: the S1 polymorphism predominates in Brazil, Argentina, Paraguay, Peru, and Venezuela; PS2 in Brazil and Venezuela; and PS3 exclusively in Colombia (the main differences are on SNPs on the gp43 gene). Variations in virulence, susceptibility to sulfonamides, and accuracy in serodiagnosis have been related with different polymorphisms, principally between S1 and PS2 [44•, 45]. The disease is associated with exposure to the fungus in agriculture, specifically in cotton, coffee, and tobacco plantations; decreased risk has been observed in plantations, such as sugar plantations, that are heavily treated with pesticides. Tobacco consumption seems to be associated with a predominance of chronic disease in men 30 to 60 years of age (13–70:1 ratio). This predominance could be related to a protective effect of β estradiol in women. Although women can be readily infected, estrogens seem to affect the mycelial-to-yeast transition, and they also seem to increase the secretion of interferon-γ and the levels of TH1 cells and decrease the levels of interleukin (IL)-10 [43, 46•], as shown in experimental models. In a retrospective study, 82% of 27 women with paracoccidioidomycosis were menopausal, and in several studies conducted in prepubertal children, the rate of disease was similar in both sexes; this clinical finding supports the experimental evidence [28••, 41, 42••, 43]. Further population-based studies are needed to corroborate the protective influence of estrogens in women and to determine the labor risk in urban and rural areas. Culture is still the diagnostic gold standard. In tissue, the fungus is abundantly present with yeast cells, which allow for direct diagnosis by fine-needle aspiration. Serodiagnosis is based on identification of specific antibodies by immunodiffusion. Antigen detection is also available by identification of gp43 by enzyme immunoassay [42••, 45]. Chronic pulmonary or pharyngeal infections account for 90% of cases. Pulmonary involvement is usually interstitial, followed by fibrosis [47, 48, 49, 50]. Although it is the most common cause of death by a systemic mycosis in Brazil (followed by cryptococcosis), mortality rates vary between 1.18 and 3.48 deaths per million inhabitants . The treatment of choice is itraconazole, which has been demonstrated to be superior to other antifungals in several comparative clinical trials . Hospital-acquired infections frequently cause morbidity and mortality. Candida bloodstream infections are a good example; they are the fourth most common cause overall of hematogenous infections in the United States, and they rank fourth to seventh in Europe [1, 52]. In multicenter studies conducted in Brazil and in Mexico, it has been found that 4% of nosocomial bloodstream infections are caused by Candida species [53, 54, 55]. C. albicans is the most frequently isolated yeast worldwide. In the United States, C. glabrata is the second, but in Latin America, C. tropicalis and C. parapsilosis are the most important species after C. albicans [54, 56]. C. tropicalis is usually isolated from neutropenic patients and other immunocompromised hosts, perhaps because of the extensive use of prophylactic fluconazole in the region. C. parapsilosis has been associated with central venous catheter infections because of its ability to form biofilms, and it has been a significant pathogen in neonatal intensive care units [2•, 54, 56], even more important than C. albicans [57, 58, 59, 60, 61]. The incidence of bloodstream fungal infections is 0.28 to 0.96 per 1,000 admissions in the United States and 0.2 to 0.38 in Europe, whereas in Latin America these rates vary between 1.2 and 5.3 (0.2–0.5 cases per 1,000 patient-days) [1, 2•, 54, 55, 57]. Preliminary data in two referral centers in Mexico City showed an incidence rate of 2.8 cases per 1,000 hospital discharges, which corresponded to 0.38 per 1,000 patient days (Table 1) . 3.6% to VOR (C. glabrata 15.6%, C. krusei 18.2%). 2.7% intermediate to FCZ (C. glabrata, C. parapsilosis). Crude mortality rates of about 40% have been reported worldwide; in reports from Brazil, Mexico, Argentina, Chile, Colombia, and Costa Rica, the mortality rates vary between 20% and 63% [53, 54, 59, 62, 63, 64]. Lower mortality rates have been reported in outbreaks caused by C. parapsilosis [60, 63], but this rate seems to vary between different age groups: 24% to 34% in neonatal intensive care units; 43% in children less than 1 year old; 23% in children 1–12 years of age; and 40% to 63% in adults (Table 1) [53, 54, 60, 65]. In Latin America, amphotericin B desoxycholate continues to be the antifungal drug most commonly used, followed by fluconazole [54, 55, 62, 66, 67]. Echinocandins and other amphotericin B formulations are rarely used because of their higher cost. Antifungal resistance studies have been conducted globally and regionally. Overall resistance to FCZ varies between 1% and 6%. However, when analyzed by species, resistance to fluconazole in C. albicans, C. parapsilosis and C. tropicalis is less than 3% [54, 55, 58, 60, 61, 62, 63]. Resistance to fluconazole in C. tropicalis has been reported in up to 6% to 8% of cases, but these results could be influenced by “the trailing phenomenon” seen in susceptibility testing. C. glabrata and C. krusei are usually more resistant (30% and 70%, respectively) [58, 67, 68]. In these large studies, resistance to amphotericin B, echinocandins, or voriconazole has not been found [69••]. Cryptococcosis is caused by a complex group of basidiomycetes, usually yeasts of 2–10 mm in diameter. This complex is called Cryptococcus neoformans and is divided in two varieties: C. neoformans var neoformans (serotypes A and D, genotypes VNI–IV) and C. neoformans var gattii (serotypes B and C, genotypes VGI–IV). About 95% of cases are caused by var neoformans, and serotype A (var grubii) is responsible for 95% of those. This pathogen has ubiquitous distribution. C. gattii is endemic in tropical and subtropical regions, and is usually observed in immunocompetent individuals . Cryptococcosis is the most important cause of fungal meningoencephalitis worldwide, affecting immunocompetent as well as immunocompromised individuals. It may cause other clinical patterns, such as fungemia, pneumonia, and lesions of bone, skin, and soft tissue. Meningoencephalitis is the most common clinical form of cryptococcosis in Latin America, with 85% of cases caused by C. neoformans ; 80% are associated with HIV infection [72, 73]. More than 215,000 patients with AIDS and cryptococcosis were observed between 1980 and 2002, and 60% of the patients were concomitantly diagnosed . The prevalence of meningitis in Mexico has been about 7% to 11% in patients with HIV, with a decreasing trend in recent years [2•]. Some studies reported Cryptococcus to be the fourth or fifth most common yeast isolated in blood cultures; sometimes it is even more common than C. glabrata [28••, 60]. The incidence of cryptococcal meningitis varies according to the population being studied. In Rio de Janeiro, the incidence was 0.3/100,000 inhabitants in 2002, increasing to 0.68 in 2003 . In Colombia, this rate was determined to be 0.24/100,000 inhabitants among the general population, but 3/1,000 in HIV patients . A multicenter Ibero-American study done in 2003 collected 340 strains derived from humans, animals, and soil and found that C. neoformans var grubii (serotype A) was the most common species (56% to 93.3%). The VNI genotype was the most common in Mexico, Guatemala, Venezuela, Brazil, Colombia, Peru, Chile, and Argentina (45% to 93.3%). C. neoformans var gattii was isolated in 3% to 41%, and the VGI and VGIII genotypes were the most frequent. Of note, genotypes VNIV and VGII were not identified in Mexico in this study, but a later report found these genotypes in two isolates from Mexico (Table 2) [28••, 71, 75]. Most cryptococcosis cases (75–95%) occur in HIV-infected young men (<40 years old) [75, 76, 77]. In this subgroup, C. neoformans var grubii genotype VNI has been the most frequent pathogen isolated, and most of the patients show counts below 100 CD4+ cells [71, 74, 76, 77, 78]. da Cunha Colombo et al. reported 81 HIV-infected patients with cryptococcosis; 50% died before receiving highly active antiretroviral therapy (HAART), and among those who received treatment, 25% showed signs of immune reconstitution syndrome (IRIS), and 33% of the latter group died. Cryptococcosis is the second most frequent cause of death as a result of a fungal infection in Latin America. Mortality rates in Africa and Latin America are unacceptably high (31% to 75%) when compared with 20% in developed nations. Alcoholism and high lactate dehydrogenase (LDH) levels (> 400 U/L) have been found to be significant risk factors for death [47, 72, 73, 78, 79]. Patients without HIV infection usually have other immunosuppressive conditions that predispose them to this infection. The immunosuppression in these cases has been attributed to defects in the cellular immune response as part of the disease or conditioned by immunosuppressive therapy, as seen in patients with systemic lupus erythematosus, transplant recipients, and patients with malignancies who are undergoing chemotherapy . However, recent reports have found no underlying disease in 5–10% of the patients with cryptococcosis; this situation may delay diagnosis and treatment and worsen the outcome [74, 76, 77]. Antimicrobial susceptibility surveillance studies have shown that more than 99% of the isolates are susceptible to amphotericin B, fluconazole, and flucytosine. Pfaller et al. analyzed 1,811 isolates from five different geographic regions and showed that isolates from Latin America had results similar to those from other regions. Lizarazo et al. reported susceptibility of 93 strains between 1997 and 2005, finding that more than 97% of them were susceptible to amphotericin B. He also found that isolates of C. neoformans var grubii were 100% susceptible to fluconazole and itraconazole, but C. gattii isolates were only 88% susceptible to these agents. Current treatment guidelines for cryptococcal meningoencephalitis recommend the use of amphotericin B desoxycholate plus flucytosine, but in Latin America, 80% of patients are treated with amphotericin B desoxycholate and fluconazole, with results similar to those of the standard treatment [76, 77, 78]. IFIs caused by Aspergillus species, Fusarium, Mucormycosis, Scedosporium, Trichosporon, Rhodotorula, Alternaria, Bipolaris, and Curvularia have been extensively described in patients with hematologic neoplasias, transplant recipients (especially bone marrow transplants), persons living with diabetes, and patients under chronic high-dose steroid treatment. In Latin America, IFIs have been described that were caused by this group of pathogens, especially Candida and Aspergillus (>90% of the cases). In the same group of patients, the more relevant risk factors were profound neutropenia, monocyte count less than 100 cells for more than 4 days, and elevated serum level of reactive protein C .
In patients with profound neutropenia and fever, up to 7% of the cases are caused by an IFI. After candidemia, the most important pathogens involved are Aspergillus spp, Fusarium spp, and mucormycosis agents. In Latin America, bronchopulmonary aspergillosis has been reported as the third leading cause of deep mycosis, and mucormycosis as the eighth most common cause in some general hospitals , [83•, 84]. Characteristically, diagnosis can only be established by histopathologic findings such as angioinvasion or by the isolation of these pathogens from the bloodstream. 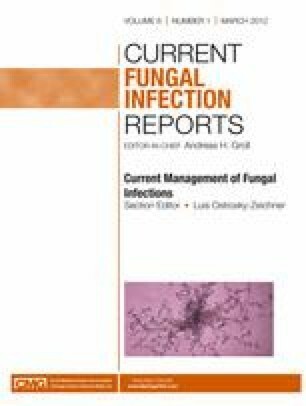 Candida spp and Aspergillus spp are responsible for 80% to 90% of all IFIs. A large amount of knowledge about Aspergillus has been accumulated recently, especially regarding its biology, epidemiology, risk factors for infection, host characteristics, clinical pictures (acute invasive sinusitis, allergic sinusitis, pulmonary invasive aspergillosis, allergic bronchopulmonary aspergillosis, aspergillomas, intestinal and cutaneous aspergillosis), treatment, and preventive strategies. Studies have considered all types of patients, but most have emphasized patients with hematologic neoplastic diseases or bone marrow transplant recipients. Aspergillus is the most common cause of IFI in patients with allogenic HSCT in Latin America, with a bimodal distribution (before posttransplant day 30 or after day 90), and it is the second most common cause in solid-organ transplant recipients. Aspergillosis occurs in 3% of patients with bone marrow transplants and in 1.3% of hepatic transplants, rates higher than the reported incidence in surveillance studies in the United States and Europe [5, 6, 7]. The most common species is A. fumigatus, and the most common clinical presentation is pulmonary, followed by sinusitis [81, 85, 86]. Diagnostic tools that have been implemented include culture, histopathology, and serologic methods; galactomannan in serum by immunoenzymatic assays has proven to be useful when determined in multiple serial samples in several circumstances, including early diagnosis in probable invasive infection (with concomitant improvement in outcome), and therapeutic follow-up to monitor treatment efficacy [85, 87, 88]. Recently, several institutions in Latin America have incorporated its use for the routine evaluation of high-risk patients. Voriconazole is considered the first-line treatment for this clinical condition, but amphotericin B desoxycholate is still used in Latin America because of economic reasons. Crude mortality from aspergillosis ranges from 30% to 83% worldwide, and mortality rates in Latin America are higher than 70%, especially among HSCT recipients. Mortality in solid-organ transplant recipients is lower than in HSCT recipients worldwide [5, 6, 7, 87, 88]. Antimicrobial susceptibility testing in 50 clinical isolates of A. fumigatus (from México, Peru, Argentina, and France) showed a splendid susceptibility to itraconazole (MIC90 = 0.25 mg/mL), voriconazole (MIC 90 = 0.25 mg/mL), and amphotericin B (MIC90 = 1 mg/mL), similar to other results from two recent international studies [89, 90]. One of the most common mold IFIs seen in immunocompromised patients is caused by Fusarium spp septated fungi. Three clinically important species have been recognized: F. solani, F. oxysporum, and F. verticillioidis. These IFIs are therapeutic challenges worldwide because Fusarium spp are often resistant to most antifungal agents. Fusariosis causes fungemia (>60%) in immunocompromised patients, with or without endocarditis, skin lesions (60–80%), sinusitis, and lung disease. In immunocompetent patients, fusariosis tends to be a superficial infection (keratitis and onychomycosis) or to cause locally invasive skin or soft-tissue infection . Brazilian investigators reported an overall incidence of 5.97 cases per 1,000 HSCT recipients; HLA-mismatched related-donor HSCT recipients showed the highest incidence and autologous HSCT recipients, the lowest. A trimodal distribution of fusariosis (early, late, and >1 year after receipt of HSCT) has been described, and Fusarium is well known as the second most important invasive filamentous fungi in immunocompromised hosts. The crude mortality rate reported in Latin America is 66%, but in patients with disseminated disease and persistent immunodeficiency (as in prolonged neutropenia and monocytemia and chronic high doses of corticosteroid), mortality is as high as 100%; similar results were reported in the Transplant-Associated Infection Surveillance Network (TRANSNET) database [5, 6, 92, 93]. Management of this IFI depends on accurate identification. The first line of therapy is high-dose amphotericin B desoxycholate (>1.5 mg/kg per day). Voriconazole can be used as a second choice, and posaconazole and other antifungal combinations have been described as salvage therapy in cases of invasive fusariosis. Adjunctive treatment is based on identification of cases requiring surgical debridement and patients who can tolerate less immunosuppressive therapy as well as granulocyte colony-stimulating factors . Caused by hyaline aseptate fungi, the most common species are Mucor, Rhizopus, Rhizomucor, and Lichtheimia (previously Absidia), although Cunninghamella Bertholletia and Apophysomyces elegans also are frequent causes. Multicenter studies have described an increase in the incidence of mucormycosis, which has become the third leading cause of IFI among high-risk immunocompromised patients, after Aspergillus and Fusarium. Major risk factors for mucormycosis include profound and prolonged neutropenia and chronic high-dose corticosteroid use, as well as tissue iron overload, uncontrolled diabetes, hypertriglyceridemia, voriconazole prophylaxis (mainly in HSCT), or previous skin and soft-tissue trauma [8, 95]. The most commonly seen clinical forms are rhinocerebral, pulmonary, osteomuscular and skin diseases. Some clinical reports and brief series of cases in Latin America have been published, all of which share the same characteristics: late diagnosis, biopsy as the main tool in diagnosis, and high mortality rate. The mortality rate has decreased with the use of combined therapy using antifungal drugs and extensive surgical debridement [95, 96, 97, 98, 99, 100, 101, 102, 103]. An extensive search of the medical literature from Latin America seems to show that the incidence of IFIs has increased for both endemic and opportunistic fungal infections. The increase of endemic IFIs is probably related to population changes (migration, tourism, and increased population growth), whereas the change in the incidence of opportunistic IFIs is likely to be associated with an increase in the number of people at risk. In both cases, the early and appropriate use of standard and new diagnostic procedures has improved the diagnosis and patient outcomes. Histoplasmosis has shown interesting characteristics. It seems to be more aggressive because of some genetic characteristics, as evidenced by more frequent skin involvement among Latin American patients. In addition, tuberculosis plays a major role as coinfection in people living with HIV in this part of the world. Opportunistic IFIs caused by yeasts have been extensively studied in Latin America, where the incidence of bloodstream infections due to Candida appears to be higher than in Europe and the United States. In addition, the Candida species distribution in this region is different, probably due to strong variations in the quality of health care for high-risk patients. IFIs caused by filamentous fungi have increased in the past two decades, and an additional increase in the number of these IFIs should be expected. Invasive mold infections have a high mortality rate because of poor drug susceptibility, a greater population with prolonged immunocompromise, and the lack of appropriate tools to obtain an early diagnosis. Therefore, multicenter and large clinical, epidemiologic, and susceptibility surveillance studies are needed in Latin America to improve our comprehension of the IFIs among the population at risk. J. Sifuentes-Osornio: member of advisory board of Pfizer, Merck Sharp and Dohme, and GlaxoSmithKline, travel funding from Biomerieux; D. Corzo-León: none; L. Ponce-de-León: member of advisory board of Pfizer, Merck Sharp and Dohme, and GlaxoSmithKline, travel funding from Merck, Sharp and Dohme.